Year-round ice cream in Chicago with signature flavors. : University of Chicago graduates Jeff Wilcoxon and Chris Hill created Bobtail Ice Cream Company. 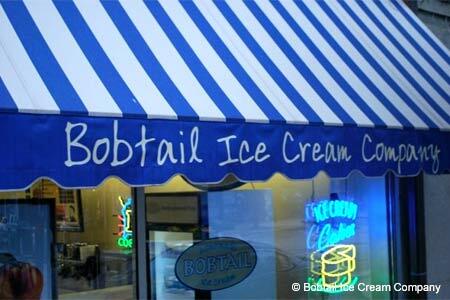 Featuring both classic and specialty ice cream flavors (Signature Sunset, white chocolate peanut butter cup), Bobtail is a one-stop shop for your individual and large scale needs. Buy in bulk for a special event or leave with a Bobby Joe (choice of ice cream blended with ice, espresso and coffee). Warming Chicagoans' sweet tooth in the winter months, Bobtail serves Steamers (ice cream, topping and steamed milk), seasonal flavors such as pumpkin, and hot brownie sundaes.